The killings perpetrated at the Pulse lesbian, gay, bisexual, trans, intersex and queer (LGBTIQ) nightclub in Orlando in the United States leave us in profound grief. Our thoughts are with the victims and their loved ones, predominantly from the Latino community, and all the victims of hate crimes against LGBTIQ people around the world. We are participating in and initiating solidarity rallies, in many countries grieving over the biggest concentrated slaughter of LGBTIQ people since the Second World War. The fact that Daesh hailed this slaughter reveals even more clearly the ultra-reactionary character of this organization. But the bigotry behind this is not new, not created and encouraged by one single culture or religion. In the US, the country where the killer was born and raised, right-wing politicians denouncing the Orlando massacre nonetheless hypocritically persist in blocking LGBTI rights. Denunciations from other sources in other countries in the name of Christianity refuse even to acknowledge that the victims were LGBTIQ people. 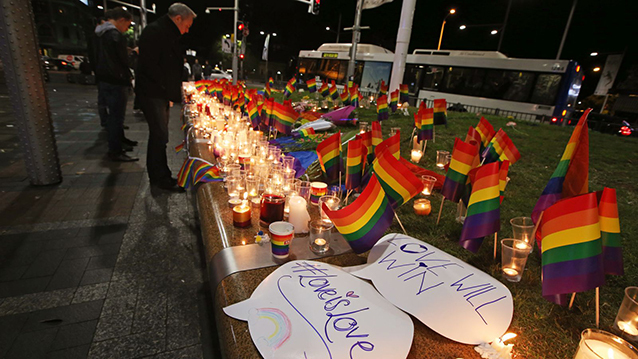 LGBTIQ people – and particularly trans women – are targets of murderous hate crime across the globe. The dead and wounded in Orlando were the victims of an ongoing, bloody clash between two right-wing ideologies. One ideology preaches sexual repression in the name of theocratic fundamentalism. The other instrumentalizes LGBTI rights in the interests of anti-Muslim racism and imperial interventions. Muslim LGBTIQ people, cruelly victimized by both these two ideologies, have been particularly eloquent in exposing them both; we are angry that their voices have been so little heeded. We reject both these ideologies, and vow to continue joining in the fight against them both, in the name of sexual freedom, peace and human solidarity worldwide. This statement was written by the Bureau of the Fourth International at its June 19th meeting.